Recorded in two known modern spellings Headworth and the more usual Hedworth, this is an English locational surname from the village of Hedworth, near Jarrow, in the county of Northumberland. The village was first recorded in the 1086 Domesday Book as "Heapeworp", meaning the area (worp) covered by heather. Most locational surnames were usually granted either to the local lord of the manor and his descendants, or more often when peoiple moved away often in search of work. It was the practice in the medieval times, and to some extent remains so even in the 20th century to call "strangers" by the name of the country, region, or place, from which they came. 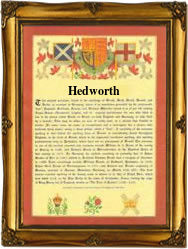 This can also lead to the development of "sounds like" spellings, and that is definately so in this case, the spelling as Headworth not being found in the original records of Northumberland. Early examples of the surname recording taken from authentic church registers include Adryan Hedworthe of Newcastle upon Tyne on January 20th 1582, George Hedworth at St Martins in the Field, Westminster, on August 25th 1642, and Robert Headworth, christened at St Dunstans in the East, Stepney, London, on September 7th 1709. This first known recording may be that of Bridget Hedworthe, also at St Martins in the Field, Westminster, on December 27th 1575 during the reign of Queen Elizabeth 1st, 1558 - 1603..